The 1928 Book of Common Prayer is a treasured resource for traditional Anglicans and others who appreciate the majesty of King James-style language. This classic edition features a Presentation section containing certificates for the rites of Baptism, Confirmation, and Marriage. The elegant burgundy hardcover binding is embossed with a simple gold cross, making it an ideal choice for both personal study and gift-giving. 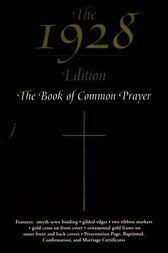 The 1928 Book of Common Prayer combines Oxford's reputation for quality construction and scholarship with a modest price - a beautiful prayer book and an excellent value.